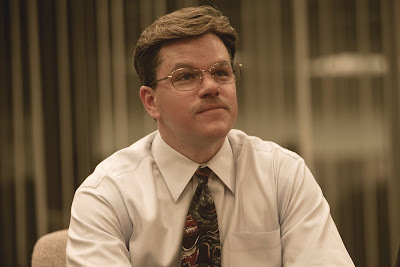 Coming soon in the cinema is Matt Damon's latest project "The Informant" where he will be playing a character named Mark Whitacre, the highest-ranking corporate whistleblower in U.S. history. 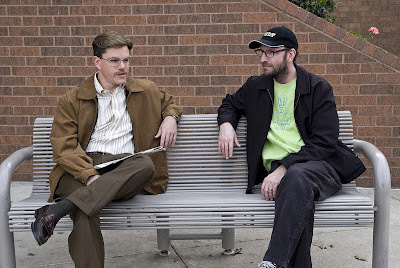 Question: What drew you to the role of Mark Whitacre in The Informant!? Matt Damon: It’s one of the best roles I have ever been offered. And what’s funny is that it came up a while ago. It was in 2001. I was on my fourth round of reshoots on The Bourne Identity, I’d had two movies come out that totally bombed, the Bourne movie had been delayed for a year, and all the signals were that it was going to be a disaster too. So it was in that climate that [director] Steven [Soderbergh] called me and said he had found something for us to do together. Q: How did you get from there to here? Damon: It’s weird because I did three other movies [Ocean’s Eleven, Twelve and Thirteen] with Steven before we got to this. We always knew that once we had a spare two months we could go and make The Informant! but we never seemed to have a spare two months that coincided. But in a way it was great to walk around for seven years knowing we had that bullet in our gun. Q: Did you go and meet the real Mark Whitacre? Damon: No, because once Steven decided to do it as a comedy—and I think it’s a very funny film, by the way—it became something different and it didn’t have to be a rigorous character study, so it didn’t seem like meeting him would be the right thing. I know that he has seen the movie though and he liked it. Q: Why do you think he did the extraordinary things he did? Damon: I had to decide for myself what made him tick and I don’t really want to say what I decided. But there are certainly several different theories that can be argued for. Q: The big shock at the start of the film is how different you look. Among other things, you gained a lot of weight. What was the thinking behind that? Q: You reportedly gained a total of 30lbs [14 kg] for the role. How did you gain it and how did you lose it? Damon: All I did was eat like I ate when I was in college and it came on shockingly fast. Losing it was not any fun. Q: Do you have a preference for making big blockbusters like the Bourne films or more character-based pieces like The Informant!? Damon: I just want there to be space for both. A lot of the edgier stuff certainly seems to have gone to TV and it seems like films have to get bigger and bigger in order to get people to theaters. But I think if you keep to a certain budget and don’t take too long to shoot it, there is still room for more thoughtful films like this one. Q: I understand you shot this film very quickly. Was that just about saving money? Damon: We shot in 30-something days, whereas it takes months to do one of the Bourne or Ocean’s films. But saving money wasn’t the primary goal. Steven’s theory on comedies is that you take as long as you need on the script and then you shoot it really fast to keep the energy and pace there. And I like that a lot. By the time we got to set it was more like we were doing a play. I knew the whole thing back to front. It made for a very joyful experience. The true-to-life film will be shown exclusively at Ayala Malls Cinemas (Glorietta 4, Greenbelt 3 and Trinoma) starting Oct. 21 and distributed by Warner Bros., a Warner Entertainment Company.